?? ?ESB Tree Week launched today with a survey of parents that reveals almost a third of children in Ireland (31%) have never climbed a tree and 1 in 10 have never even visited a forest or wooded area. The findings of the survey also reveal that parents claim nearly half (48%) of Irish children spend more time in front of a screen than outdoors. Highlighted in the results was a generational divide, with 74% of parents saying they used to climb trees “often” or “all the time” when they were children, yet they say only 5% of Irish kids climb trees “all the time” today. At a time when mindfulness and meditation are increasing priorities for families across Ireland due to work-life imbalances, stress and financial pressure, trees are proven to have a positive impact on mental health and wellbeing. The research backed this up with 82% of the respondents commenting that walking through a forest had a calming effect on them. Tree Week runs from March 6th – 13th and aims to reignite the nation’s love of trees through hundreds of events all over Ireland. 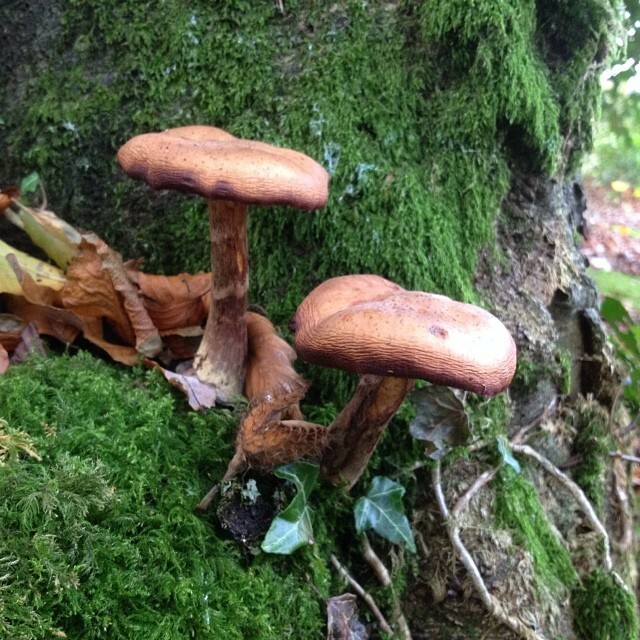 People are encouraged to visit www.welovetrees.ie to find out about local events happening in their area and to find ways to get outside to learn, grow and enjoy trees. 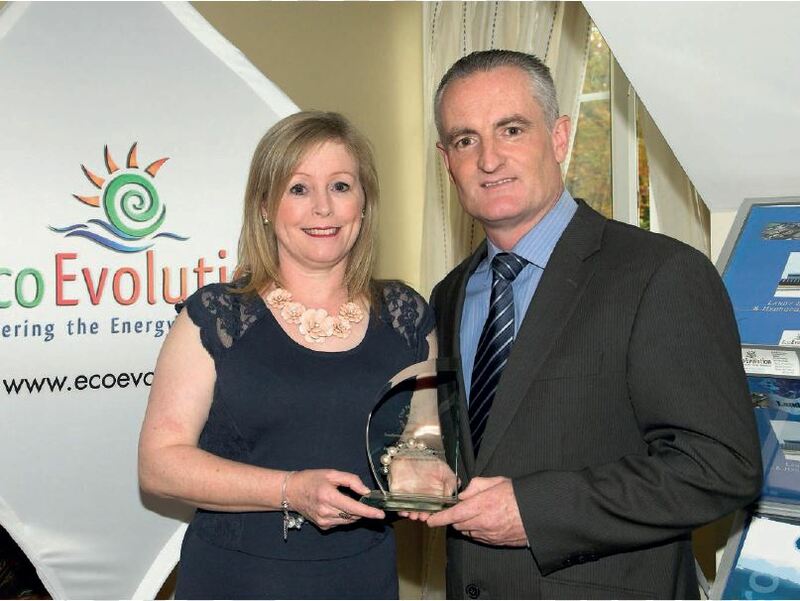 The event will be launched in the National Botanic Gardens in Glasnevin at 2pm on Sunday March 6th, 2016. With a wide range of events from tree planting to poetry readings there is something for everyone during Tree Week 2016. National Tree Week is an annual week long fun festival about trees organised by The Tree Council of Ireland. In celebration of National Tree Week individuals, families, schools and local communities are encouraged to participate in and support events taking place around the country during the week. Coillte will also supply 15,000 saplings throughout the week long event. Kilbora Woods, Ferns, Co. Wexford. By doing something as simple as planting a tree, everyone can play their part in making a difference to our efforts to live more sustainably, bringing about huge benefits, many of which will have long term impact in times of climate uncertainty. Despite great advances in the past 100 years, Ireland remains one of the least wooded countries in Europe with only 11% of our land planted with trees compared to the European average of 40%. 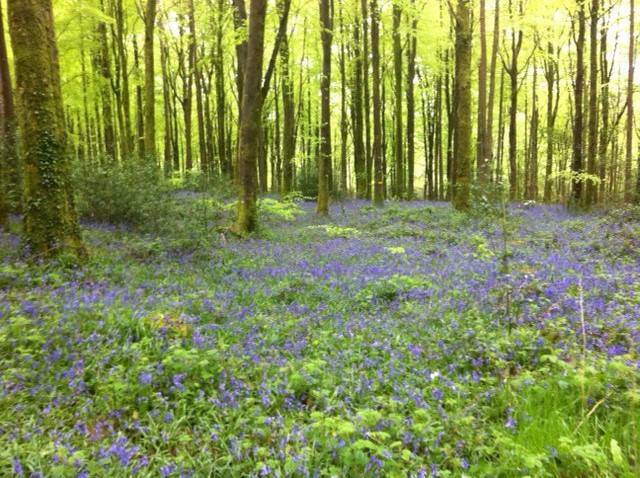 Ireland has agreed a target to increase our forest cover to 17% by 2035. This initiative will provide new jobs, build our forestry industry and help improve our environment. On a global level, trees play a significant role in mitigating against climate change by soaking up carbon emissions and in the sustainable wood resource they provide. Trees also improve air quality, providing us with clean air to breathe, and reduce the effects of flash flooding and soil erosion. They give shade to make streets and buildings cooler in summer and improve the energy efficiency of buildings by providing shelter and reducing heat loss. Without trees, life on earth would be intolerable. It’s easy to get involved as an individual or as a group. The Tree Council of Ireland invites you to organise one or more events for the week to celebrate trees. As well as tree planting ceremonies especially those that involve the planting of native Irish trees to help compensate for loss of natural habitat and in turn benefit our birds, bees, pollinators and all wildlife the range of events can include forest and woodland walks, nature trails, workshops, woodturning displays, talks, tree hugging, tree climbing etc. – the choice is yours! What can you do to celebrate National Tree Week? Check out the National Tree Week events programme and take part in an event near you. Celebrate National Tree Week in your school by planting a tree or in the classroom by drawing pictures or making leaf prints or bark rubbings of trees, read or write poems or stories about trees, learn how to measure the height and spread of a tree, produce a class drama about trees. 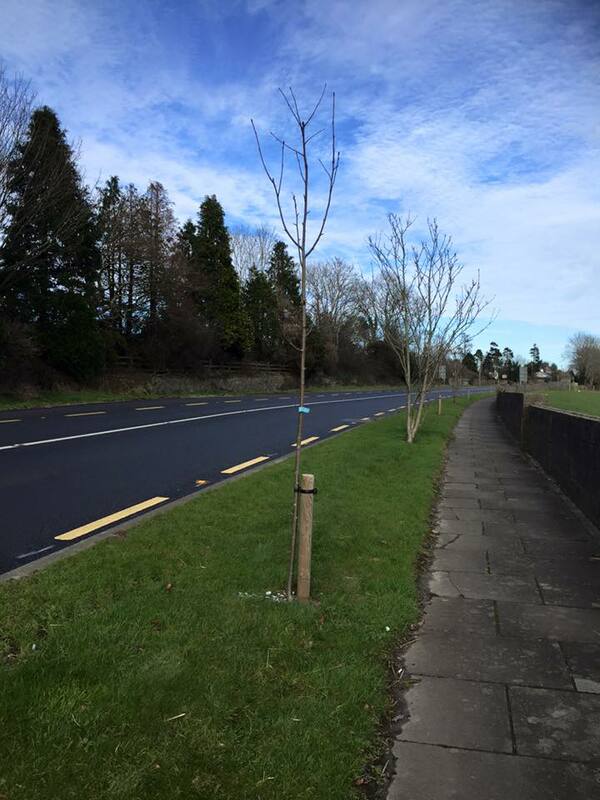 Encourage your local residents association, tidy towns group, youth club, sports club or other local organisation to get their members involved in a tree planting or tree maintenance project (eg. clean-up a local woodland) in your area. Volunteer in a local community tree-planting event. You’ll meet new people and make a difference in your community. Organise a walk or trail to showcase and tell the stores of any large, unusual or historic trees in your community. Commemorate an event of significance in your community by planting a tree and organise a community celebration or get together to mark the occasion. 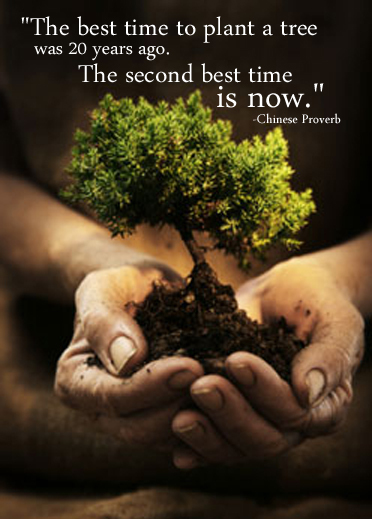 Celebrate the week in a personal way by planting a tree yourself in your own garden. Take some time to read a book about trees or find our more about their characteristics, their uses, folklore etc. Learn to identify trees in your neighbourhood. Enjoy the outdoors. Visit a local forest or park or take a nature walk and enjoy observing and being in the company of trees. Those in the business community could sponsor a community tree project. Even the smallest garden can accommodate a tree! Just because your garden is small, don’t think that you can’t have trees. One of the advantages of planting trees is that there is a species to fit every location, regardless of size. Many people with small gardens only have space for one tree so choosing the right one is important. When planting in small enclosed spaces, it is advisable to plant trees that have a small crown spread. Eventual height is an important factor too. Even small ornamental trees may, over time, reach a height of 6-7m or more. If you only have room for one tree ideally look for one with more than one feature or season of interest such as coloured bark or fruit or autumn colour following on from flowers. Some Native Tree Species to consider for Small Gardens. Strawberry tree (Arbutus unedo) – Slow growing evergreen with shredding brown bark and dark green, leathery leaves. Clusters of pinkish white, pitcher-shaped flowers and red strawberry-like fruits are borne together in late autumn and winter. Height 5m. Spindle (Euonymus europaeus) – Although inconspicuous for much of the year, this small tree is very showy in autumn and early winter when the leaves turn blazing scarlet and masses of rose-red capsules split open to reveal orange seeds. Height 4m. Silver Birch (Betula pendula) – Distinctive silvery-white, peeling bark that becomes marked with black, rugged cracks as it gets older. In spring, yellow-brown male catkins appear and in late autumn the diamond-shaped, bright green foliage turns yellow before falling. Height 12m. Betula pendula ‘Youngii’ is a weeping form that develops a mushroom-headed habit with branches reaching to the ground. Rowan (Sorbus aucuparia) – Choose the fastigiate form. Leaves turn deep, fiery red and yellow in autumn. Sprays of white flowers cover the tree in late spring, followed by bunches of red berries in autumn. Height 8m. Yew (Taxas baccata) – Choose the columnar or fastigiate form. Slow growing coniferous tree forming a dense, compact column. Height 3m. Trees are essential to our world and offer a wide range of benefits to our environment so for the week that’s in it we should also remember that recycling saves trees! 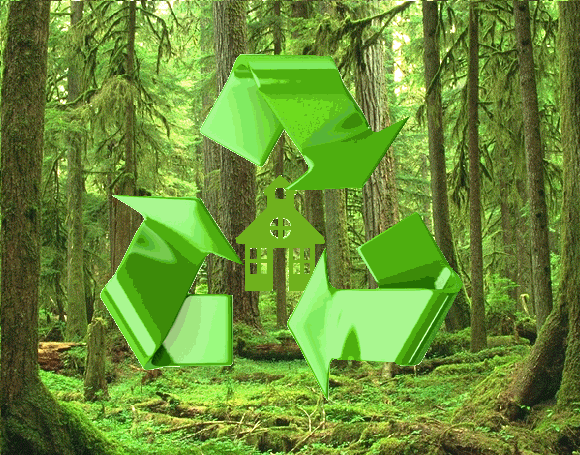 Each ton of recycled paper can save 17 trees, 380 gallons of oil, three cubic yards of landfill space, 4000 kilowatts of energy, and 7000 gallons of water. This represents a 64% energy savings, a 58% water savings, and 60 pounds less of air pollution. What are your plans to celebrate National tree Week 2016? Hedge cutting season is over – sign the petition to help save Ireland’s nesting birds. 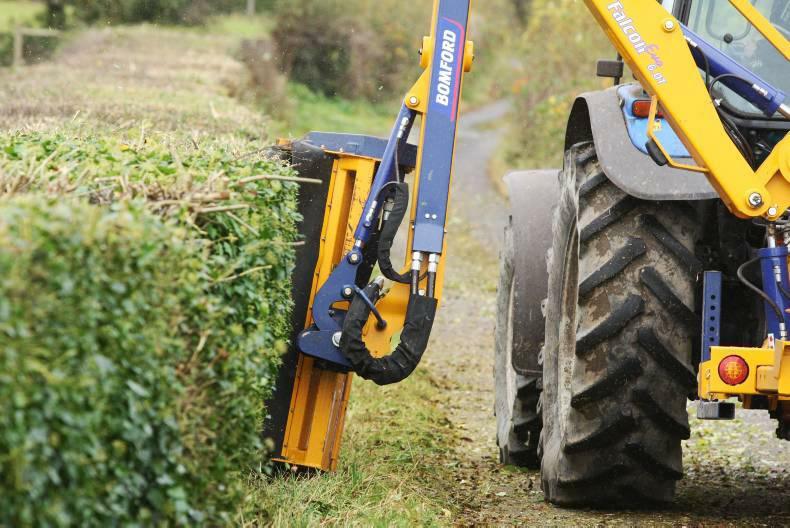 Hedge cutting is illegal in Ireland from 1st of March till 31st of August. Despite attempts by the Minister for Arts, Heritage and the Gaeltacht, Heather Humphreys T.D., to change the laws regulating these dates by introducing the Heritage Bill 2016 earlier this year, it is important to note that the proposed date changes were ultimately NOT made. This is because the bill failed to pass through both houses of the Oireachtas before the recent dissolution of the Dáil in advance of the general election. Hedgerows are essential for maintaining wildlife diversity, supporting species such as badgers, owls, hedgehogs, stoats, blackbirds and innumerable plants, butterflies and other insects. Not only are they an invaluable resource for much of our wildlife they are vital in providing pollinators, cleaning our air, defining our landscape, storing carbon and by holding back the flow of water off land they can alleviate flooding. (a) It shall be an offence for a person to cut, grub, burn or otherwise destroy, during the period beginning on the 1st day of March and ending on the 31st day of August in any year, any vegetation growing on any land not then cultivated. (b) It shall be an offence for a person to cut, grub, burn or otherwise destroy any vegetation growing in any hedge or ditch during the period mentioned in paragraph (a) of this subsection (above). The existing law provides exemptions for road safety and other circumstances and should be read carefully to ensure compliance. 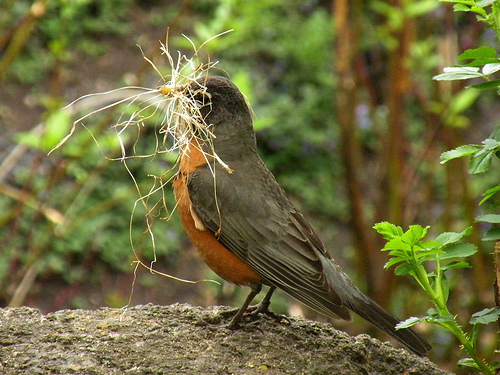 Section 40 of the Wildlife Act exists to protect nesting birds. Many of our upland bird species are in decline and are in danger of extinction in Ireland; amongst them is the Curlew, which has declined by 80%. Many birds which nest in hedgerows into August including the endangered Yellowhammer, Linnet and Greenfinch are also in serious decline. If you see any unlawful hedge cutting, grubbing, burning or destruction please report details to the Gardaí or to the local Conservation Rangers of the National Parks and Wildlife Service (NPWS). Reported instances will, as far as practicable, be investigated. 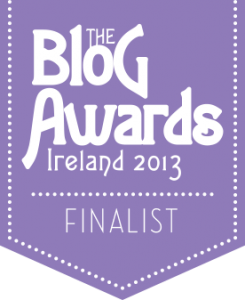 Your local NPWS Office can be found through the NPWS website at http://www.npws.ie/contact-us. No more slash and burn. The Irish Wildlife Trust, Birdwatch Ireland, An Taisce and Hedge Laying Association of Ireland created a campaign ‘No to more slash and burn’ to persuade Minister for Arts, Heritage and the Gaeltacht, Heather Humphreys T.D. to reconsider her proposal to change the Wildlife Act to allow for the burning of vegetation in March and hedge cutting in August and establish proper hedgerow and upland management regimes that works for farming, road safety and wildlife. Join the campaign to persuade the Government to reverse this decision before the Heritage Bill 2016, is passed through the Oireachtas and sign the petition to show your support for the wildlife that do not have a voice. If we do nothing, we risk losing yet more of our natural heritage here in Ireland. To date over 16,400 have signed the petition. 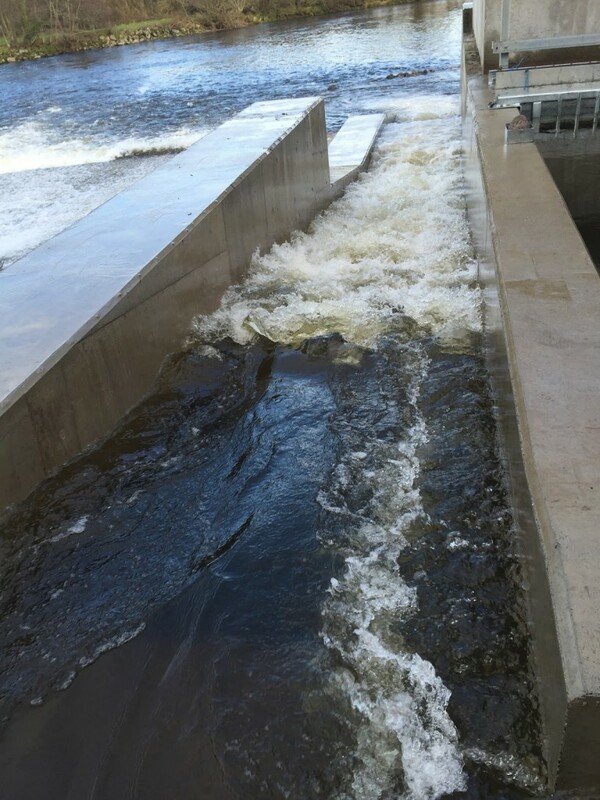 The Totnes Weir hydropower scheme was developed by Dart Renewables and when completed it is estimated that the two Archimedean Screw hydropower turbines rated at 150kW each will generate 1,200 MWh of renewable energy every year, enough to power the equivalent of around 400 homes and saving 500 tonnes of C02. It is expected that around two thirds of the electricity generated will be used to power King Edward VI Community College, which serves around 1,700 students, and Atmos Totnes, a community development involving the construction of 60 to 70 social housing units and housing for older people. Numbers of migratory salmon and sea trout are in decline in the river Dart, in part due to difficulty in passing the Totnes weir. The species are currently being held at the weir, where seals predate, leading to mortality of the fish. 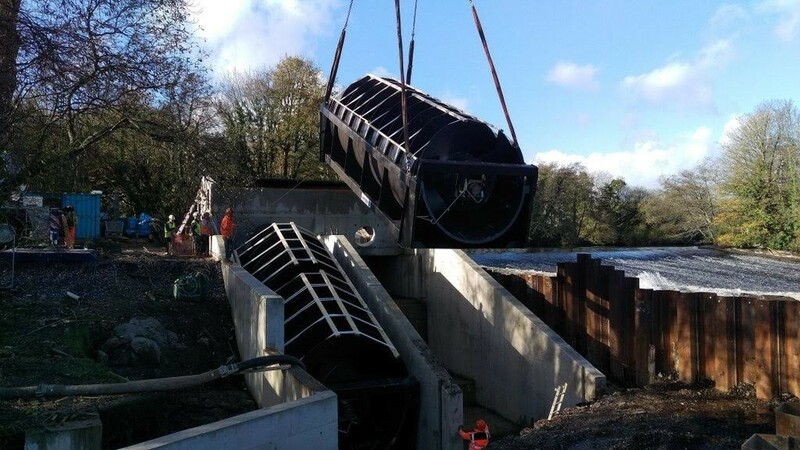 The construction of the Totnes Weir scheme will include the installation of a modern fish pass which allows the fish to pass the weir and continue their journey upstream to spawn. It is expected that this will reduce salmon and sea trout losses in the river Dart and over time increase the population of these species in the river Dart catchment. The scheme would also encompass an additional Larinier type fish pass, alongside the repair of the existing pool-and-traverse fish pass. Underwater cameras and a fish counter will estimate Salmon and Trout migration to spawning grounds in the Upper Dart. This will provide valuable data on the species in the river Dart which will be shared with both the Dart Angling Association and the Environment Agency. 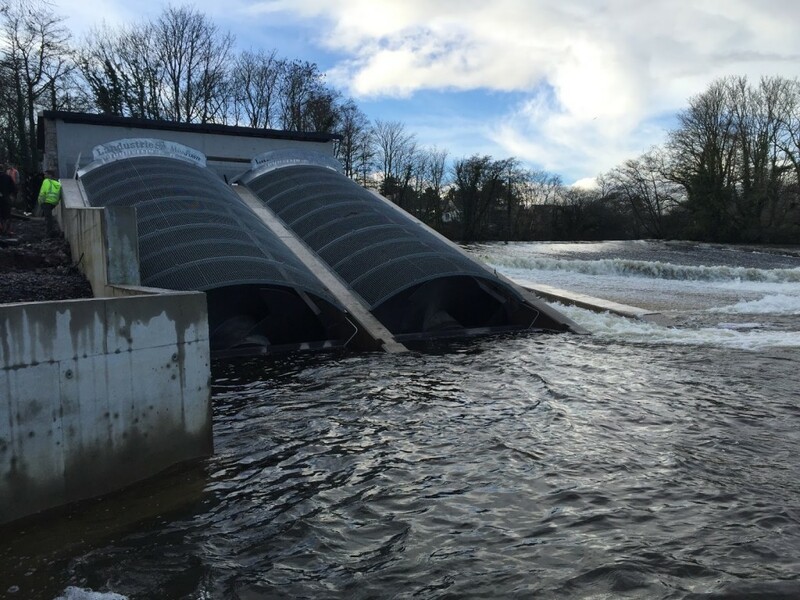 Dart Renewables developed the Totnes Weir scheme in close conjunction with the local community in Totnes and the scheme will benefit the community in a variety of ways. Around two thirds of the power generated by the Totnes weir scheme will be used to power the local school in Totnes, King Edward VI Community College (KEVICC), and a community development of affordable homes and community facilities for the Totnes area which is being managed by the Totnes Community Development Society (TCDS). Electricity will be sold to these organisations at a mutually beneficial rate compared to prevailing market rate. 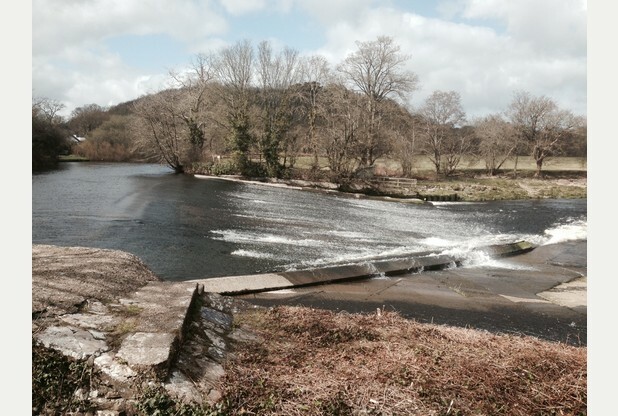 The Environment Agency, the Dart Angling Association, the TCDS and TRESOC (the Totnes Community Energy Society) have been closely involved in the consultation process for the Totnes Weir scheme and are very supportive of the project. A small classroom complex is proposed for the site next to the weir to be used by a KEVICC educational trust. 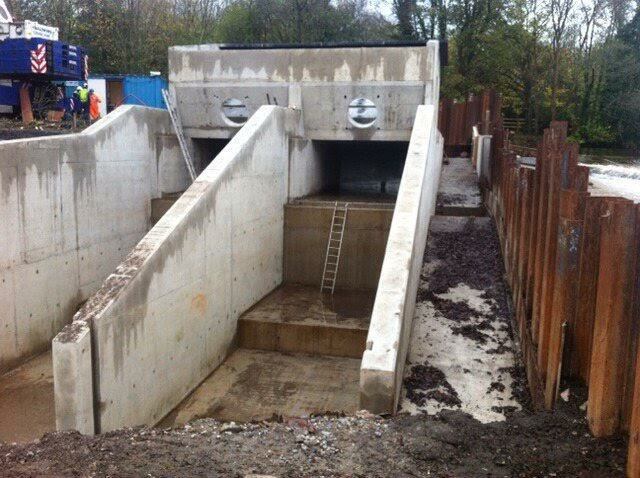 Fishtek were responsible for the design of the new Larinier fish pass and the improvements and modifications to the existing fish pass on the far side of the river from the hydropower scheme. 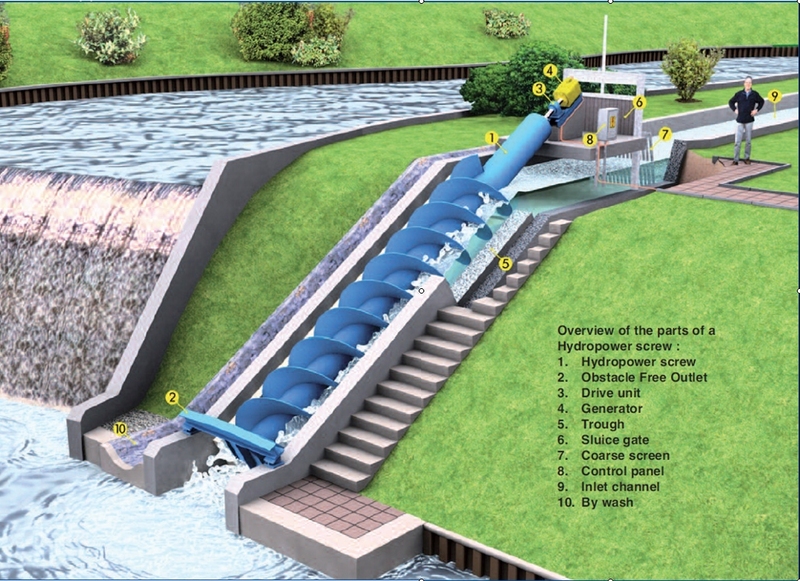 A few images of the turbines and fish pass are shown below. The fish pass can be seen in the images above (running at a very high level as the turbines were temporarily turned off when these images were taken). 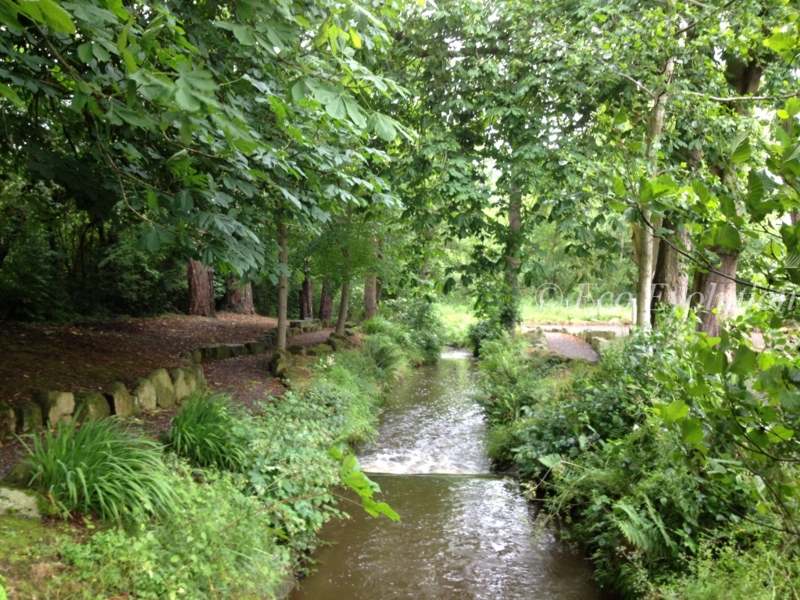 A fish counter is to be added at the upstream end of the fish pass very shortly and this will provide invaluable data for the ongoing monitoring of fish populations in the river. Triodos Bank helped Dart Renewables raise the £1.3 million needed to build the hydro power scheme through a Bond Issue. Local investors were offered the opportunity to invest a minimum of £2,000, with the minimum for those living further than 15 miles from Totnes being £10,000. Investors could earn up to 8% return a year for up to 8 years. Once again we see the Ancient power of Archimedes being used for hydropower generation because if it’s fish-friendly credentials. The Archimedean Screw turbine provides a fish-friendly alternative to conventional turbines, ideally suited to low-head (1m-10m) sites, and sites with fish protection issues. Extensive fish passage tests have conclusively demonstrated that the large water chambers and slow rotation of the Archimedean Screw allow fish of all sizes, and debris, safe passage through the turbine. As a result, the Environment Agency has agreed that no screening is required. If you are the owner of an old mill site or a potential hydro site or are a community group interested in developing a hydro project for community use please contact us here. 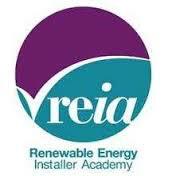 Energy generated from flowing water resources gives the highest efficiency rating of all sustainable energy sources! The Archimedean Screw hydropower turbine is a new application of an ancient technology. For thousands of years the screw was used to pump water up from rivers or streams to irrigate farm land. Now, using the same system in reverse the Archimedean Screw is being used to harness the power of the water to generate hydroelectricity. Hydropower installations generate renewable energy from flowing water resources. This could be from a lake, river, stream or from old mill sites. This technology lets you harness the power of the water that flows over or through your land. Once your turbine has been commissioned and connected to the grid you’ll be generating hydro-electric power 24 hours a day, seven days a week. Whether the power is for your own property, to sell back to the grid or a combination of both, the Archimedean Screw will likely pay for itself several times over in the course of its operational lifetime (depending on the feed-in tariffs available) . And what’s more these turbines can be scaled to suit all needs – from small domestic applications to huge industrial installations. If you’re not sure whether your site is suitable for an Archimedean Screw we’ve put together a checklist of requirements for your reference. Archimedean Screw turbines offer a uniquely flexible hydropower solution that can be installed at sites with a broad range of topographical features. But there are some fundamental requirements your land will need if a project can go ahead. A grid hook-up point less than 500 metres from the water source – unless the Screw is being used for ‘off grid’ generation only. If your site satisfies these criteria then there’s every chance you will be able to harness the power of the waterway to generate hydroelectricity. 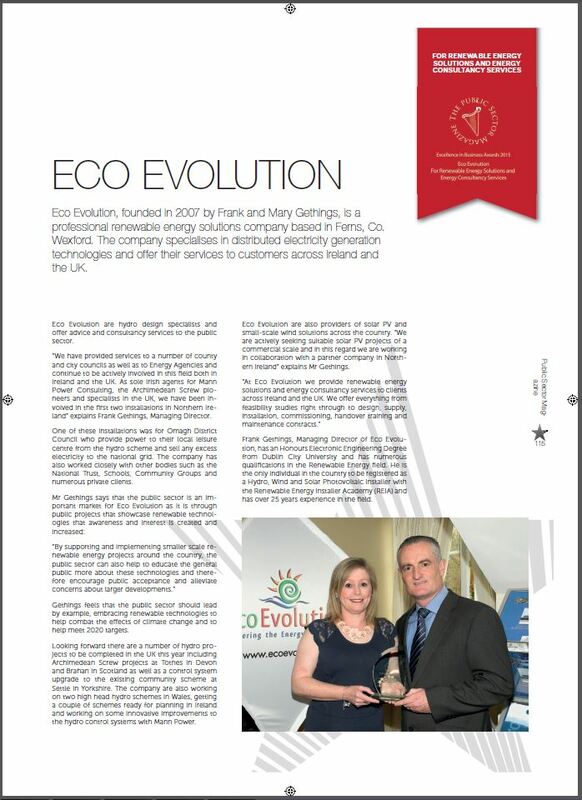 And Eco Evolution will be delighted to pilot your scheme all the way through to delivery. If you’re still not sure whether your site is right for an Archimedean Screw turbine, get in touch and we will be happy to discuss the specifications and requirements in greater depth.